A skirt to match my trench coat. After all of the cutting and ironing, I was dying to see how the gabardine and Burberry would sew up, but I didn’t want to get ahead of the Sew-Along. So, tonight I whipped up the skirt from the Simplicity 6976 pattern. It’s a simple A-line skirt in the very neutral camel gabardine, but the skirt facing is the Burberry rain wear, which is a fun touch that I’m very happy about. The skirt still needs a zipper and a hem, but I’m going to wait to put in the last stitches once the trench coat is finished. If I do end up wearing them together, should the hem of the skirt peek out below the trench coat? 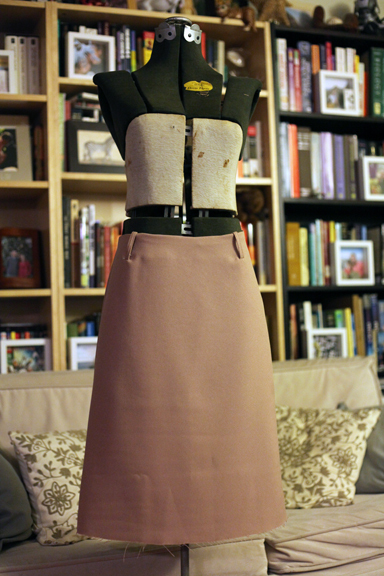 Hemmed as is, the skirt will be a couple inches longer than the trench coat. Since the skirt and trench coat are the exact same neutral color, does it even matter? Maybe I should just focus on finding the skirt length that’s most flattering on me? you are quite the seamstress! is that your own manequin-thingy? The dress form used to belong to my Grandmother, and then my parents gifted it to me this past Christmas. I brought it home on the airplane if you can imagine! I think you’re right about the skirt length. Funny that I don’t even know what length of skirt is best for me… I guess now is a better time than any to figure that out! I quite like how the pattern has 2 lengths – one longer than the coat, and one shorter – I think they both work! I cut the skirt too, just managed to squeeze it out, but it had to be the short one. Yours looks great made up, it is handy to have a matching skirt for those ‘hard to find anything to wear’ days! I had enough fabric to cut for the longer of the two. I figure I can always go shorter. I picked up a zipper last night so that I can finish up all but the hem. Then I’ll pin it to check for length. Any suggestions as to how to determine if a length is “flattering”? What a cute little skirt! I’m doing the sewalong, too, and I’m thinking of making a skirt this afternoon from my jacket fabric because I’m itching to get into the sewing and I find making a skirt or pants before the jacket helps give me an idea of how the fabric behaves before I’m elbows deep in tailoring. I plan to make a post on skirt lengths, and playing with golden ratio numbers. 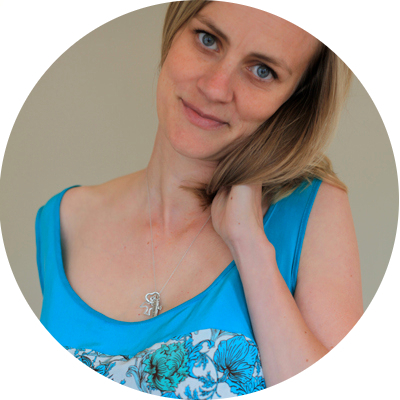 It’s something I do regularly and sometimes mention, but I want to go into it in depth so other people can use the same principles for themselves…. Cool blog, I like the Julius Caesar quote. Yes, do post on skirt lengths. I’m just getting ready to insert the zipper, and then all I’ll have left to do is the hem. I still might wait and hem the skirt once the coat is complete, but I like the idea of a flattering length better than an arbitrary length due to the length of my coat or the length of the pattern. I remember the golden ratio from school… It would be fun to pull it back out to help guide my sewing. And, what a fun blog you have. Thanks for saying hello and sending me your link. I can’t wait to see how your corduroy jacket turns out!